Home 2017 November 8 Pay to Play? College athletes are some of the busiest people in the country, especially for their age. They must spend hours per day working at their sport and getting better at it while maintaining academic success. This situation for thousands across the country leads to the everlasting argument of whether or not these athletes should be compensated with money for the hard work they put in day in and day out. Though they do work harder than the average college student, paying them is simply a bad idea. They are already compensated in scholarships and opportunities, payment would rip the integrity from the college game, and the logistics behind the idea of paying the players are simply not there. As a regular student myself, I fully understand just how rare it is to get a major scholarship to college and how useful it can be. When these student athletes are earning these scholarships, they are often times half-ride scholarships or even full for the best of the best. These scholarships are insanely valuable, especially for players going to an out of state school. These scholarships can save tens, even hundreds of thousands of dollars total. Many argue that it is not fair to say the scholarships are enough compensation because often times the education is wasted as the athletes simply do not have all the time they need for school because they must spend it on their sport. It is true in fact that the average graduation rate for teams in March Madness in 2010 was only 43% (Best 8). However, this is simply due to a lack of motivation and logical thinking. These players are being offered scholarships for educations they would simply not have the opportunity to get if not for their talent in their sport. Many of the players simply do not try in school because they truly believe they will play in a professional league when in reality very few of them do. There are thousands of examples across the country of student athletes finding success in the classroom and going on to do amazing things after sports. For example, Gerald Ford, our former president, was and All-American center for the University of Michigan before going on to lead the free world. The players must realize that they are student athletes and that the student aspect of their lives should always come first. There are many people in America that prefer college sports over professional sports because they see professional athletes “as overpaid, under-worked crybabies who behave like a bunch of spoiled first graders” (Marshall 10). In college, the attitude of the players is far different because they are all playing simply because they love their sport. While some do have professional hopes and play for a future check, about 90% of them are playing simply because they want to and this is what is so great about college sports. It is so easy to see the passion in the eyes of the players. It is a great example of the purity college sports really hold and it is essential to the amatuer game. If money becomes involved, players will pass up playing time on small teams for a bigger paycheck on teams that will have them sitting on the bench. This is a sacrifice that is sad to think about players making all because they want a little bit more money in their pocket. If college athletes were to get paid, there are so many factors that would affect how it would work that it simply does not make sense to do it. Who would pay the players, their university or the NCAA? And if they were to get paid, where would the line be drawn? There are simply too many student athletes in the country to have each one get paid, so which of them would receive this compensation, only the ones that play for the big revenue sports like basketball and football? How much variation in the size of the paycheck would there be between an All-American and a backup? Simple questions are the ones that can make one realize that it is simply not logical to pay student athletes all across the country. The argument of paying college athletes is one that will likely never end as each side has so many good points and it is simply too hard to make any change at any given time over a topic on such a grand scale. The NCAA does, however, always consider the idea as there is recent news of talks about adding a paycheck. While the NCAA may think about the idea, they must see the backlash it could cause on the players, teams, and sports as a whole if payment becomes involved with these young athletes. It is an idea that needs to be tucked away in order to preserve the sports and keep them as fun to watch as they always have been. BestCollegesOnline.com. “14 Surprising Facts About Being a College Athlete.” BestCollegesOnline.com, 19 Jan. 2017, www.bestcollegesonline.com/blog/14-surprising-facts-about-being-a-college-athlete/. Marshall, Blake, and The Daily Utah Chronicle. “Should Athletes Be Paid to Play?” USA Today, Gannett Satellite Information Network, 20 Oct. 2016, college.usatoday.com/2016/10/20/should-athletes-be-paid-to-play/. Pay to Play? by Colin is licensed under a Creative Commons Attribution-ShareAlike 4.0 International License. After reading your post, I agree that paying college athletes should not happen. Students spend too much time focusing on their sport they forget about their education. College athletes tend to have low graduation rates. If athletes were to get paid then it would be useless because they won’t learn as much as they should since they end up leaving school. In fact, “40% of all college athletes receiving scholarship money, transfer, leave their school, or do not graduate within 6 years” (1). What this is saying, is that most student athletes that are receiving the benefits of their scholarship, don’t pay attention to their education. This leads to them leaving their school, or not graduating at all. Also, “Despite the NCAA’s insistence that it is concerned about student athletes’ academic growth, it often feels as though “student” plays second fiddle to “athlete” (2). These college athletes think of education as one of the next things to worry about compared to their sport. They cannot multitask, by focussing on the two main things they go to school for. Education usually gets pushed down the list. Another reason why I think paying athletes should not happen is because most students don’t care about money, they just want to play the game. Most athletes have the mindset of performing their best and working hard because they want to. For example, in a series of interviews “all 3/3 Division 1 athletes preferred to play because of enjoyment. The surveys also showed that 2/3 D1 athletes said money wasn’t really important in their life since it was either covered by the scholarship, or they only needed little for spending” (3). The money they needed for spending was a low amount of money they already had. This survey is coming from former D1 college athletes, proving that most of them did not have the thought of money on their mind while they were playing. They want to focus on their sport and play because of enjoyment. In addition, when involving money players will neglect their playing time on small teams for a larger paycheck on other teams that will cause them to end up on the bench. This is a sacrifice that is pointless to think about, since players want a little more money in their pocket. In your argument you stated that “While some do have professional hopes and play for a future check, about 90% of them are playing simply because they want to and this is what is so great about college sports” (4). A majority of college athletes obviously have professional hopes, but end up playing because they enjoy it. Even with their dreams of becoming a pro, that thought isn’t always present when they play. Enjoyment means the state or process of taking pleasure in something. Taking pleasure in playing is more important to college athletes then the pleasure of money. Furthermore, there are simply too many athletes in the country to have each one get paid. 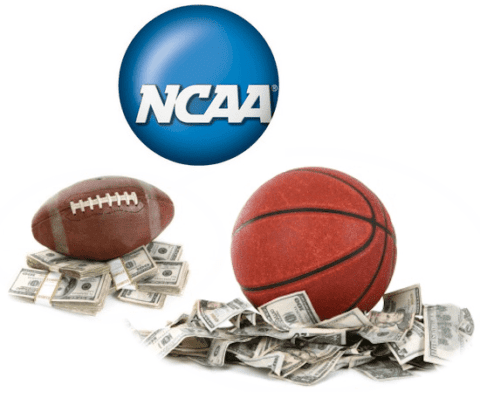 Having every college athlete being paid can cause a lot of money loss. Since there are so many players the amount of money being spent is unbelievable. In between two years (2009-10) there were “approximately 167 thousand Division 1 athletes. If every athlete received the maximum award ($7,000), that would require addition FWS (federally-funded aid program that gives students jobs) funding of $1.17 billion each year, with more than $876 million coming from the Federal government. The Federal government says, 79.5 percent of full-time students receive some form of financial aid. If that same number is applied to college athletes, the total cost of the program is now $202 million each year, with $50.6 million coming from the schools” (5). This is proving that millions of dollars would be spent each year if college athletes were paid. The FWS is losing all this money when it is not even needed. SInce the number of athletes are increasing over time and gaining themselves scholarships, then the amount of money paid each year could end up doubling the amount they would already have to pay. One other thing, is that most school often make other purchases, not realizing how much money they are losing. Six years go a school called Rutgers University made a large purchase which was “an expansion to the football stadium that cost $102 million. The goal of this expansion was to bring more money into the program. However, today, the deficit for the Rutgers athletic department tops $36 million, which is the same as losing $1 every second for an entire year, which is losing money that could be used for athletes” (6). All the money that they lose would leave them with little to pay all the college athletes. With how many players there are, that is simply way too much money whens it’s already been spent on other things. Personally, the fact that athletes don’t want to be paid, there are too many of them to pay, and that they forget about their education while playing is why this should stop being an occurring issue. I think it would be so hard for college players to get paid because then we will have some many questions. Like does everyone get paid the same? Does different sports get paid the same? Paying the athletes will probably have some programs shut down because they couldn’t afford it. LIke D2 or D3 programs that are barely getting by right now. I think we have along time until this conversation get really serious. Nice work, Colin. I really liked your stance about paying athletes in the NCAA, and I agree with your point. They already are offered a scholarship to play, and they use a lot of time for their sport. Just like them, students who work in labs or in other places also spend as much time working or researching, and many of them aren’t offered a scholarship. However, I think that the university or NCAA should pay for medical treatment and other costs because the athlete played for the university’s name but was injured, ruining the chances of going pro or other ways to earn a salary in the future. What is your stance on the medical treatment?